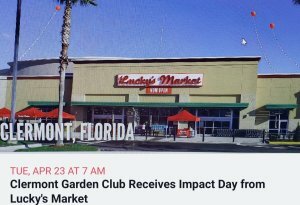 Clermont Garden Club has been selected for an incredible opportunity to be the recipient of LUCKY’S MARKET Impact Day on Tuesday, April 23, 2019. Clermont Garden Club will receive 10 % of the day’s net store sales! How can you help? Spread the Word! Let all your friends, family, schools, churches, athletic teams and associations know to shop Lucky’s Market on this special day! Help Clermont Garden Club continue its excellence in providing gardening assistance to East Ridge High School, scholarship assistance to the SEEK conference (Save the Earth’s Environment through Knowledge), Wekiva Youth Camp, FIT ( Families In Transition), plus other charitable programs. Clermont Garden Club’s garden, 849 West Avenue, Clermont, Florida 34711, serves as a demonstration garden for residents to learn what types of plants grow in our area along side Florida Native plants.